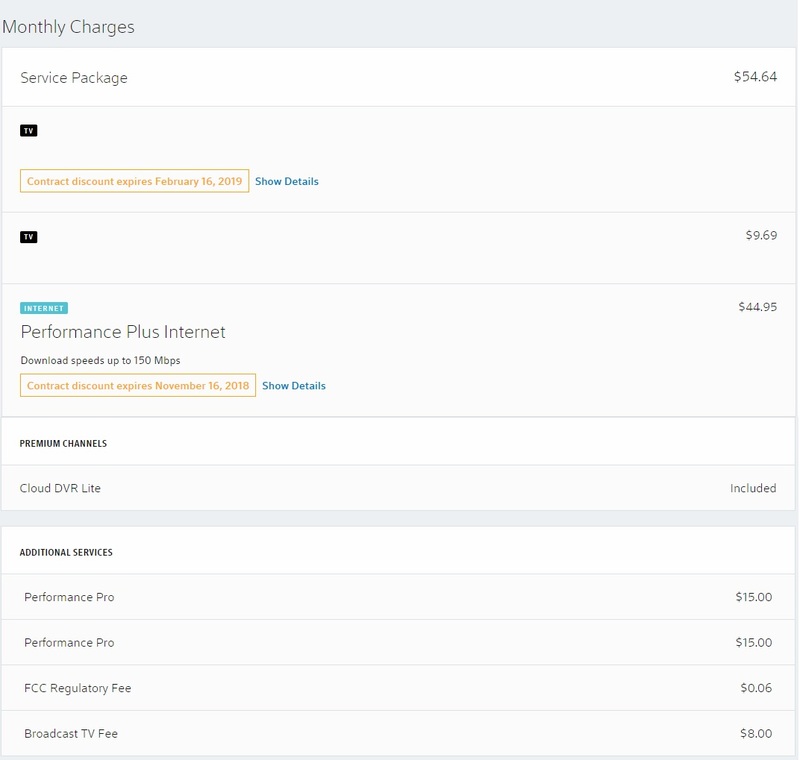 Xfinity has the worst online billing accounting I've ever seen. Sooo the best option I have for high speed internet here in WJ is Xfinity/Comcast. I receive a mailer from them about a month ago offering their Performance Pro internet for $59.99 (150 mbps+) and streaming local channel TV stations for $10 more but free trial for the first 30 days. My previous offer for their Performance Plus internet had expired and I was already paying $65. So called them up in January and asked for the $59.99 deal and they activated it and also put on streaming locals for $10 but first 30 days free so long as I called and removed it before Feb. 15th. Fast forward to this weekend. I haven't used that streaming local service and won't as I can get those free so I call to cancel the TV and I inform them that my services online look weird and that it shows the TV from the Jan-Feb as $9.69 when it should have been free because it was during that free trial. It also shows $10 for February. They claim it was free and that the $9.69 is for February and that I had a "DAY" of streaming TV free. That doesn't make any sense as it also says under that "TV" listing that starting Feb. it would be $10 per month. On top of that it also shows an $8 "broadcast TV fee" which wasn't on the marketing info and so I asked what that was for. Well, the $10 fee is for Xfinity to allow you to stream the local channels but you also have to pay $8 to access the local channels. I guess $10 is the "streaming fee" or something like that, but it doesn't matter because the first 30 days are free, right? Long story short, they place an order online to remove the TV yesterday. Great. Give me a few coupons I can use to apply to my bill so I go in and apply them. They inform me my bill every month should be $59.99 each month (plus fees/taxes) for JUST the internet and no TV. Got it. We're great, done. So I call their billing department today (yes I know it's Sunday but I want this resolved asap) and the guy on the phone first says "It looks like there's quite a mess on your bill. I see lots of changes. Let me put you on hold." After 15 minutes he comes back and says "I don't see any of the things on your bill that you are saying." I offer to email him screenshots. They don't have their own email addresses. After another 10 minutes of me explaining to him what I'm seeing and him saying he doesn't see any of that on my bill, I just gave up and asked him one simple question. "I just need you to verify to me that the ONLY things no my account is the Internet and associated internet fees/taxes. No TV or anything like that correct?" He says "Yes" and I finish the call. Somehow I feel that won't be my last call to Xfinity this month. And where they heck are my coupons I applied to my bill?